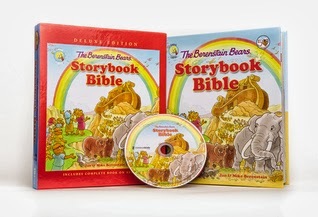 Fans of the Berenstain Bears can't get enough of the brand's first ever storybook Bible! Less than a year after its introduction, Zonderkidz is releasing a deluxe edition, complete with a read-along audio CD in a slip case box. My daughter uses the Berenstain Bears Storybook Bible as our read along Bible at bedtime. It is so much easier for a young reader to grasp and she so enjoys the photos. Now she can read along with the CD and enjoy it even more often. This is a fantastic gift this upcoming holiday season! THE BERENSTAIN BEARS STORYBOOK BIBLE DELUXE EDITION(Zonderkidz; September 2013; $24.99), by Jan and Mike Berenstain, brings to life 23 Old and New Testament stories in a spirited children's storybook Bible with classic Berenstain illustrations for kids ages 4-8. The friendly narration on the accompanying CD enriches each story and guides little ones through the text as they discover God's message in the familiar Berenstain style. The storybook Bible begins as Brother, Sister, and Honey Bear settle down for a bedtime story, but they are only interested in reading about Space Grizzlies and princesses. Papa Bear suggests a better idea. He says, "The Bible has all kinds of stories-exciting ones, nice ones, happy ones, even serious ones." Through the eyes of the cubs, familiar and beloved Bible stories are presented with simple, yet engaging retellings, including the story of Adam and Eve, Noah's Ark, and a vivid illustration of the Last Supper that will touch the hearts of young children and parents. As the cubs listen to God's Word, they envision Bible characters to look and act just like them. Their imagination comes to life through playful artwork on more than 200 beautifully illustrated pages. Sure to become a favorite bedtime storybook, THE BERENSTAIN BEARS STORYBOOK BIBLE DELUXE EDITION is a perfect way for parents to introduce the Bible to their little ones.